My shooting Safari in Northern Namibia was over. I had been very successful and had harvested a Red Hartebeest, a trophy Warthog, two Burchell Zebras, two Bull Kudu, a male and Female Gemsbok, two Kalahari Springbok Rams, a Hartman’s Mountain Zebra stallion, and an Angolan Bull Giraffe. God had certainly blessed me. I had been found worthy to hunt this amazing Continent called Africa. To tell the truth I was nervous throughout the hunt because I did not want to wound and lose an animal. This was always on my mind. I was lucky to have shot well. I had passed the test. I was extremely happy with the results of my Safari. The night after I harvested my Giraffe, my PH Barry and his wife Lizelle and I were sitting around the fire in the Boma after dinner. We had just enjoyed Mountain Zebra steaks and some very good South African wine. We were relaxing. I must say that I was quite tense during the hunt because I did not want to wound an animal. Now we relaxed. We talked about the wonderful Safari that I had enjoyed at their camp and the wonderful animals that I had bagged. They were very happy for me. We planned an excursion to Etosha Pan National Park the next day. Etosha is one of the largest Parks in Africa and is noted for it’s variety of animals. Barry said there was a chance that we would see Black-Faced Impala during our time in Etosha. We would be hunting the Impala by vehicle. No one was allowed to walk in the bush in Etosha because of the danger of Lions. We would use the Toyota truck to help us spot the Impala and other game. The next morning Barry, Lizelle, and I boarded a Toyota Landcruiser and headed for Etosha Pan National Park in extreme Northern Namibia. Etosha is one of the world’s greatest places and it has an astonishing number of animals. It is estimated that there are 114 Mammalian species in Etosha, 340 species of birds, 110 reptile species, 16 amphibian species and one fish species. The area has all types of habitat surrounding a large mineral Pan that fills up during the rainy season. The Pan is what is left of the 100 million year old Kalahari Basin and long ago was seasonally filled by the Kunene river. The Pan covers 25% of the park. The animals are sustained in their multitudes throughout the year by the water in the Pan and the year long waterholes and springs. In the San Bushman language, Etosha means, "Great White Place". Etosha had been set apart by the Germans in 1907 as a National Park of 100,000 sq km. The original Park used to be four times as large, but political pressure caused by settlers encroaching on the preserve steadily over the years has resulted in the present size of the park being approximately 27,000 sq km. For a size comparison, the famous Ngorongoro Crater in Kenya/Tanzania is about 5,000 sq km. Etosha is still one of the largest National Parks in Africa. Actually, Barry's hunting camp is only ten miles as the crow flies from Etosha and we arrived at the main park entrance, Andersson Gate, in about an hour. There was a small entrance fee, we were handed a Park brochure, and then we drove right in. There was no development on the road to the Park as there is leading to Yellowstone and Great Smoky Mountains in the USA. Upon entering the Park we immediately saw game. We saw many Kalahari Springbok and a few Black Backed Jackals. We saw some Elephants feeding in the thornbush in the distance. I read somewhere that the Indian Elephant has a humped back; while the African Elephant has a swayback. These Elephants were large, swaybacked, and grey colored. There are approximately 2000 Elephants in Etosha. There are 200 Rhinocerus, 1500 Giraffes, and 300 Lions. There is a myriad of Plains Game and Birdlife. We went to the Welcome Center at Okaukuejo, which is actually a small village with all the amenities. We went into the store and bought some candy and some soda. We went to a bar before lunch and Barry and Lizelle had gin and tonics and I had a beer. We had a lunch at the café. The café had, as do all restaurants in Namibia, white tablecloths and uniformed and polite wait staff. They offered a buffet with vegetables, rice, and wild game meat. I took some Gemsbok. The cutlet was tender and delicious. went to the waterhole and gazed upon an amazing variety and number of animals. Many of the animal species represented at the waterhole had been harvested by me during my Safari so I knew what they were. We saw Gemsbok, Wildebeest, Zebra, Springbok, and Hartebeest. A few Kudu came daintily up to the waterhole to drink. The Kudu are probably the most cautious animals in South Africa and Namibia. I know why they are called the Grey Ghosts. They move silently, cautiously, and ever so slowly when approaching the water. The water was so deep that the animals in the middle had to swim. It sure looked like they were having a good time drinking and cooling off. We saw a few bull Gemsbok sparring but other than that the animals were sharing the waterhole in a peaceful manner. I read that Elephants and Black Rhinocerus visit the waterhole but we did not see any. The Lions rule the waterhole and this is where they do most of their feeding. Lions mostly hunt at night and we did not see any cats at the waterhole. The waterhole is lit up at night for the tourists to view the nocturnal animals. I took many pictures at the waterhole, using my old Minolta XLR camera and 35 mm film. After a few hours of viewing the animals, Barry, Lizelle and I set about to tour some other areas of the Park. Driving along we saw many Zebra and Wildebeest and Springbok. We came to another large waterhole. The white Pan shimmered in the distance like a mirage. There were Ostrich, Gemsbok, Zebra, Warthogs, Springbok, and Wildebeest in great numbers at the waterhole. Everywhere there were Springbok. There were thousands of Springbok. I was on the lookout for big Springbok rams. I can honestly say that the Springbok that I harvested in the Namib were larger than the Springbok at Etosha. We saw a large Kori Bustard by the side of the road and many Martial Eagles floating overhead. There were Yellow-billed Hornbills everywhere. Etosha is fabulously rich in Avian life. We came to a brushy area and much to our delight, we saw a herd of rare Black-Faced Impala. The Black-Faced Impala is threatened in most of Africa, but, like the Mountain Zebra, which is also threatened, has enough of a population in Namibia to permit hunting of these very special species in limited numbers. They are being raised by certain Game Ranchers in Namibia to preserve the pure species. They tend to interbreed with the Common Impala. They are a CITES animal and can not be imported into the USA. There were about five female Impala and a large magnificent ram with lyre-like horns. We took a number of photos of the magnificent Impala ram. I definitely realized how fortunate I was to observe this beautiful creature. We came to another waterhole. Four mature Kudu bulls were drinking at this hole. One of the bulls only had one horn. My 56 and 54 inch Kudu bulls were bigger than any of the Kudu at the waterhole. This waterhole also had a few Ostrich and some huge tusked Warthogs. A few Red Hartebeest were also visible. And, of course, Springbok. We were driving along the dirt road. I asked Barry if we could stop to enable me to get out and take some pictures of some Black-Backed Jackals. He said that tourists must remain in their vehicles in the Park because there is always a chance that a Lion could be lurking close by and attack. About a half hour after he said this, we saw some Warthogs running frantically across the road in front of us. The Warthogs had their tails raised in the air and they were frightened. A large male Lion with a huge mane and long fangs and two swift and stealthy Lionesses crossed the road in wild pursuit of the Warthogs. We were shocked by the action in front of us. This was primeval Africa at it's finest and most primitive. The Law of Tooth and Fang happening right before our eyes!! It all happened too quickly for a photo opportunity!! I guess it was feeding time because the Namibian sun was red and setting and the sky was turning shades of pink and red. Lions are nocturnal feeders and this was their time to rule Etosha. We left Etosha after spotting the Lions and went back to camp. That night we had Mountain Zebra steaks compliments of yours truly. It had been another great day in Namibia. My Safari was over. It had been the proverbial experience of a lifetime. I was sad to see my time in Namibia end but was a very a happy man for what I had accomplished and seen. I will have many excellent memories when I get old and take up the rocking chair. BRINGS BACK MY HAPPY MEMORIES OF MY SAFARI TRIP. The description of the water hole and the animals there to drink made it seem like I was there. If I ever go to Africa, I would like to go to Etosha and see the animals. Good photo. THANK YOU FOR SENDING A PICTURE OF SUCH A RARE AND BEAUTIFUL ANIMAL.ETOSHA SOUNDS WONDERFUL; FULL OF ANIMALS. 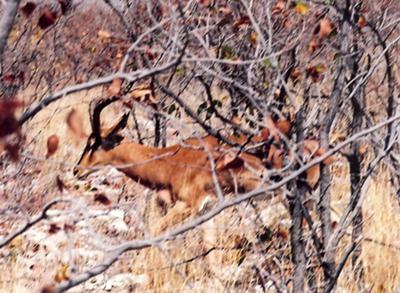 The picture showed a good sight picture of a left shouder shot if one was hunting the Impala. The story was very informative.